pbar wrote: Very nice Neil, one of the few modern cars I can appreciate actually. And I like the way these cars have become part of a motoring enthusiasts world, many people being passionate about them. I think they are a great classic of the future and certainly attract the younger Ford enthusiasts. If my son looks after this one I can only see it going up in value as good ones become rarer. Then as he was going to get it they phoned to say it had failed due to the exhaust. I thought it may have had a de-cat fitted, however they promised to get the problem sorted by the following week. In the mean time he found a buyer for his old car and managed to get himself an extra £500 pounds against what the dealer had offered P/X We picked up the car and to my delight they had fitted a good standard system My son looked a bit disappointed as he thought he could sell on the stainless exhaust to make a bit of money. He offered to buy the exhaust off them, but then they said they had sold it!!! I thought it all sounded a bit fishy, but overall I was happy that he had a standard system and IMO it sounds perfect and I think it runs a lot better. Very nice car! These and the Mondeo ST220 are probably the stand out motors for me, of recent times, as they look aggressive enough and are aggressive to suit. The later Focus ST is, IMHO, not as aggressive looking as these Mk2's. The only issue with 300bhp going through the front wheels on these is that they did not have the Revo Knuckle set up of the RS, which effectively kept the front wheels on the ground with that sort power and torque. But they are a great 5 pot lump and don't forget, not only did Ford place 300 through them (350 on the RS500), but Volvo had some power going through these as well. So they are a very respectable engine, even if they'll wheel spin everywhere. Nothing wrong with that - just need a bank balance for the tyres. Pop along to Mountune - there will be a dealer near you - and see what your son can pick up. Mountune were Ford's preferred tuners for these and you can see a safe 300. But more than that, they mess about with the torque to make it a faster car than a standard 300 bolt on. Mountune performance was warranty backed by Ford. Not that this is a concern today, given the age of the motor. But shows what trust Ford had in using that company to tune the 5 pot up. If you look on their site, he can see what he can buy and see where the local dealer is, for questions and have a chat to. 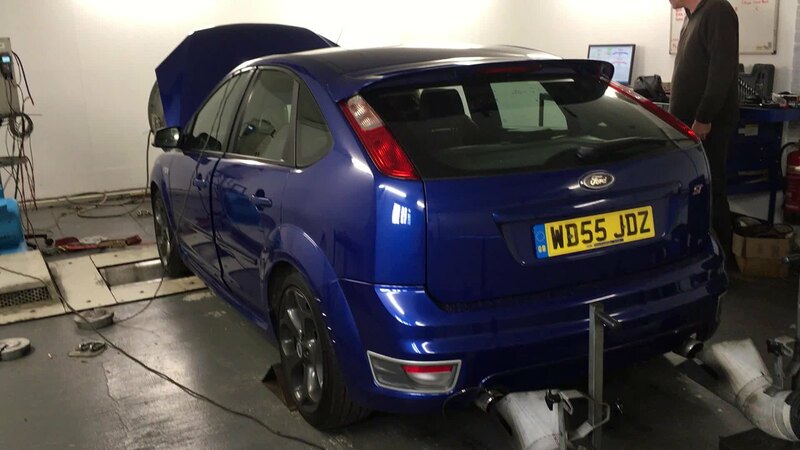 When I went to look at my last ST, it was advertised as standard which is what I wanted, but on the test drive I could tell it had been mapped as I'd had one before and this felt the same if not quicker. But because it was such a tidy car I went for it. 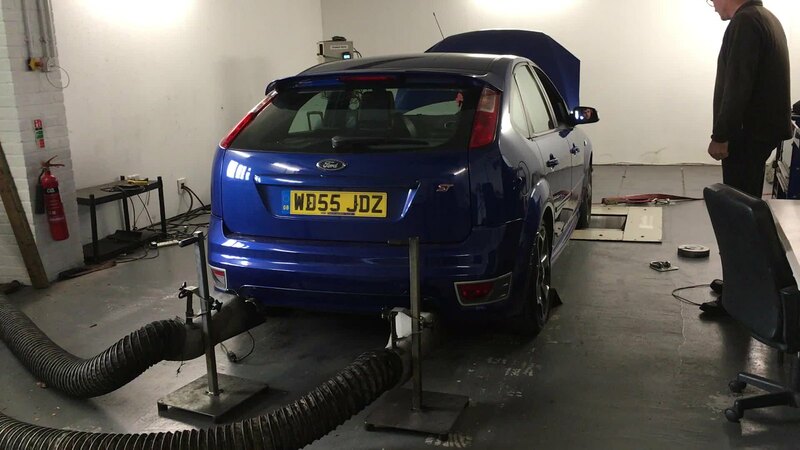 Once I'd bought it, I rang Mountune and Superchips but neither had records of the car but both recommended a bigger intercooler just incase it boiled itself...So I put a Radtec Intercooler and Cobra catback no resonated exhaust on it hoping it would now be safe. Always nice to see paperwork for this sort of thing. According to Neil, his sons car has enough power anyway But I would always like to know what map it has incase of any issues. Standard intercooler which can be seen easily behind bumper https://www.google.co.uk/search?q=focus ... ddU7rKATBM: Any bigger it's upgraded! My sons car has a standard intercooler which looks a bit battered, so he's thinking of replacing it with an upgraded one. Hopefully that will keep the temperatures down. Yeah it would be nice to find out what map it has. We can see the last 2 owners on the log book, so he could try contacting them and ask. It would be interesting to find out if it was mapped before it had a standard exhaust, as it seems a lot quicker that that it has returned to having a standard exhaust. The logbook doesn't show the previous keeper now.....So unless you have a receipt/invoice amongst any paperwork with their address or phone number, you can't contact them as I have done in the past, and I have been contacted too. 275 bhp is a good shout, I'm assuming you mean corrected at the engine. I'm still thinking its close to 300 bhp, perhaps a little over coz it scares me so much or I'm just a girl. Well I never, I didn't know that. That's taking data protection to the extreme. Well the results are below..... A lot lower than I expected BHP wise but a massive amount of torque, which I guess is why the thing feels so quick. 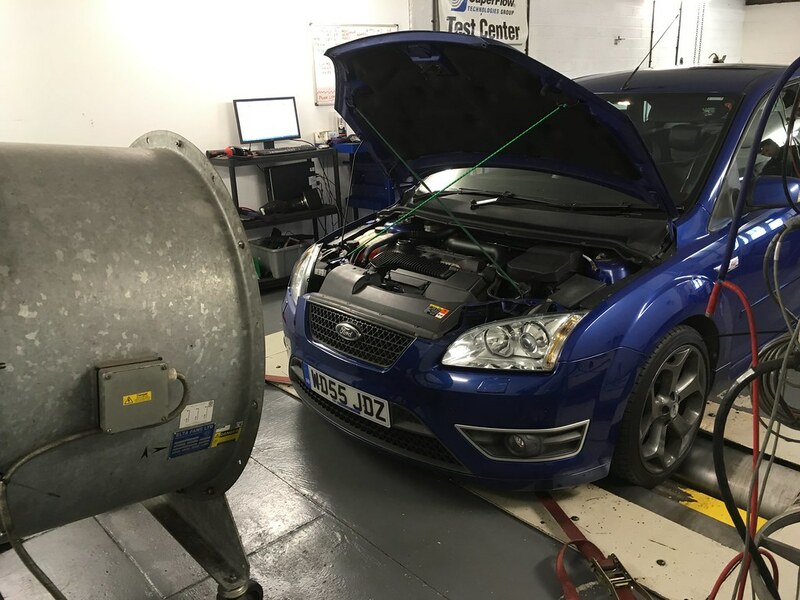 The chaps that tested it thought it was a good remap with no over fuelling and were impressed with the extra 100 lbs-ft of torque over the standard car. We walked away happy in the knowledge that the engine and clutch should be reasonably reliable. Interesting results! It would be interesting to know what map it’s running to produce such a small power increase but all that extra torque, especially as the guys were happy with how it was running. You’d think there was something amiss somewhere but clearly not. The MK2 ST is a great car, I really miss mine. Definite future classic along with the MK7 Fiesta ST.
mjcapri wrote: Interesting results! It would be interesting to know what map it’s running to produce such a small power increase but all that extra torque, especially as the guys were happy with how it was running. You’d think there was something amiss somewhere but clearly not. Good point 240bhp is a little strange as they normally start at 260ish. Despite my sons heavy right foot he seems to be getting about 25 mpg, so maybe this is a custom map more in keeping with fuel economy than outright performance. 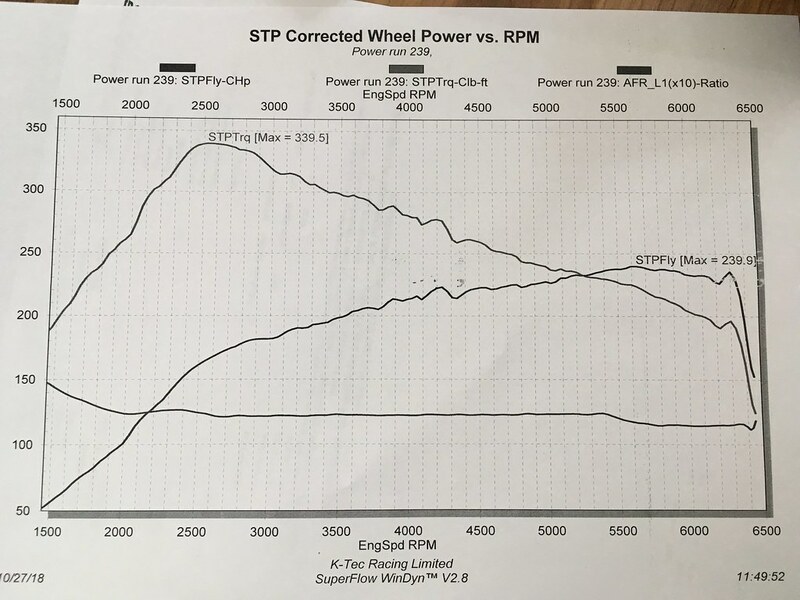 As you can see from the torque curve you can drive it sedately and it still pulls strong a bit like a diesel car. Future plans for the car is to fit an RS clutch, bigger intercooler and a more free flowing exhaust. Then it will be ready for a more radical remap. Superchips said it must be a fueling issue, but nothing to worry about.